The School of International Relations and Politics has a library consisting of 11013 books as on 30 September 2017. This includes 2089 books as gifts from various organizations and institutions including the United States Consulate, Chennai, and the Ambassador K.M.Kannampilly Collection of 996 books donated by the legatees of his estate. Apart from these the library also has 133 bound volumes of back issues of certain reputed journals including Foreign Affairs and Foreign Policy, 39 PhD theses as well as M.A and M. Phil dissertations submitted to the School since 1985. The collection of books is up to date and one of the best of its kind in India. The Kannampilly Collection has among it some very rare books. The library will soon be shifted to the more spacious ground floor of the new annex. 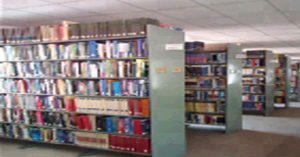 The proximity of the Mahatma Gandhi University Library is an added advantage to the School and its vast collection of books, journals and e resources are easily accessible.